I’m sure you have some old horse equipment that’s just laying around that could be put to good use. I’ve listed some ways I’ve used my old horse equipment and I would love to hear how you’ve used any old equipment. 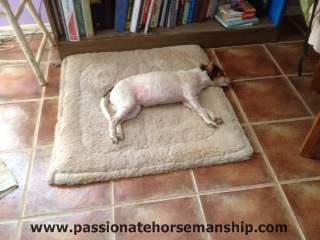 Old horse blankets instead of throwing them out clean them up and use them as a dog bed. I took a couple of my old blankets and put one in the dog house for our outside dog and the other one I put in my office for my rat terrier. What’s nice about using the blankets is that they are thick and help to keep them warmer during the winter plus your dog will have a soft bed to lay on. When I want to clean the blanket I take it outside hose it off with my eZAll spray wash and let it dry. Old hay nets you can use them to put balls in for your kids. I use my old hay nets to keep the balls that I use when I work with my horses. Old hoof picks are great to keep by the door to clean out the crevices of your boots or shoes. I have an old hoof pick with a stiff brush on it and it sure comes in handy for picking out the mud and then brushing it off. Old web halters you can use them as a harness for your dog. Bet you never thought of that. I’ve even used the larger web halters as a harness for my miniature horses when body clipping them. Used supplement buckets use these to put grain in for when you go to horse shows. If you buy the Strongid C wormer those have great lids on them you could use to carry water and not spill it because the lid fits so well. OK your turn have you re-purposed any old horse equipment? Tell me in the comments below I would love to hear about them.